issueIdentification: Named by primary coastal city, state in DEM. abstract: Digital elevation models (DEMs) of U.S. and other coasts that typically integrate ocean bathymetry and land topography. The DEMs support NOAA's mission to understand and predict changes in Earth's environment, and conserve and manage coastal and marine resources to meet our Nation's economic, social, and environmental needs. NOAA's National Centers for Environmental Information (NCEI) has built many of these models, and also distributes DEMs on behalf of other NOAA offices, as well national and international partners. Bathymetric, topographic, and shoreline data used in DEM development come from a variety of sources, including NOAA's National Ocean Service (NOS) and NCEI, the U.S. Geological Survey (USGS), the U.S. Army Corps of Engineers (USACE), and the Federal Emergency Management Agency (FEMA), as well as other federal, state, and local government agencies, academic institutions, and private companies. The DEMs are referenced to a variety of vertical tidal datums, typically mean high water (MHW) or North American Vertical Datum of 1988 (NAVD 88), and usually a horizontal datum of North American Datum of 1983 (NAD 83) or World Geodetic System 1984 (WGS84). DEM cell sizes range from high-resolution models (1/9 to 1/3 arc-second; ~3 to 10 meters) that support coastal inundation studies, to regional models (roughly 3 to 24 arc-seconds) that extend farther offshore, to global models (1 arc-minute; ~2 km). purpose: The DEMs can be used for modeling of coastal processes (tsunami inundation, storm surge, sea-level rise, contaminant dispersal, etc. ), ecosystems management and habitat research, coastal and marine spatial planning, and hazard mitigation and community preparedness. maintenanceNote: New models are added to this collection as they become available. useLimitation: Produced by the NOAA National Geophysical Data Center. Not subject to copyright protection within the United States. description: Color shaded relief visualization of a global seamless bathymetry/topography mosaic of digital elevation models at NOAA/NCEI. description: A global seamless bathymetry/topography mosaic of digital elevation models at NOAA/NCEI. abstract: A map service showing the location and coverage of land and seafloor digital elevation models (DEMs) available from NOAA's National Centers for Environmental Information (NCEI). NCEI builds and distributes high-resolution, coastal digital elevation models (DEMs) that integrate ocean bathymetry and land topography to support NOAA's mission to understand and predict changes in Earth's environment, and conserve and manage coastal and marine resources to meet our Nation's economic, social, and environmental needs. They can be used for modeling of coastal processes (tsunami inundation, storm surge, sea-level rise, contaminant dispersal, etc. ), ecosystems management and habitat research, coastal and marine spatial planning, and hazard mitigation and community preparedness. Layers available in the map service: Layers 1-4: DEMs by Category (includes various DEMs, both hosted at NCEI, and elsewhere on the web); Layers 6-11: NCEI DEM Projects (DEMs hosted at NCEI, color-coded by project); Layer 12: All NCEI Bathymetry DEMs (All bathymetry or bathy-topo DEMs hosted at NCEI). description: Shaded relief visualization of a global seamless bathymetry/topography mosaic of digital elevation models at NOAA/NCEI. abstract: The DEM Global Mosaic is an image service providing access to bathymetric/topographic digital elevation models stewarded at NOAA's National Centers for Environmental Information (NCEI), along with the global GEBCO_2014 grid: http://www.gebco.net/data_and_products/gridded_bathymetry_data. NCEI builds and distributes high-resolution, coastal digital elevation models (DEMs) that integrate ocean bathymetry and land topography to support NOAA's mission to understand and predict changes in Earth's environment, and conserve and manage coastal and marine resources to meet our Nation's economic, social, and environmental needs. They can be used for modeling of coastal processes (tsunami inundation, storm surge, sea-level rise, contaminant dispersal, etc. ), ecosystems management and habitat research, coastal and marine spatial planning, and hazard mitigation and community preparedness. This service is a general-purpose global, seamless bathymetry/topography mosaic. It combines DEMs from a variety of near sea-level vertical datums, such as mean high water (MHW), mean sea level (MSL), and North American Vertical Datum of 1988 (NAVD88). Elevation values have been rounded to the nearest meter, with DEM cell sizes going down to 1 arc-second. Higher-resolution DEMs, with greater elevation precision, are available in the companion NAVD88: http://noaa.maps.arcgis.com/home/item.html?id=e9ba2e7afb7d46cd878b34aa3bfce042 and MHW: http://noaa.maps.arcgis.com/home/item.html?id=3bc7611c1d904a5eaf90ecbec88fa799 mosaics. By default, the DEMs are drawn in order of cell size, with higher-resolution grids displayed on top of lower-resolution grids. If overlapping DEMs have the same resolution, the newer one is shown. Please see NCEI's corresponding DEM Footprints map service: http://noaa.maps.arcgis.com/home/item.html?id=d41f39c8a6684c54b62c8f1ab731d5ad for polygon footprints and more information about the individual DEMs used to create this composite view. In this visualization, the elevations/depths are displayed using this color ramp: http://gis.ngdc.noaa.gov/viewers/images/dem_color_scale.png. 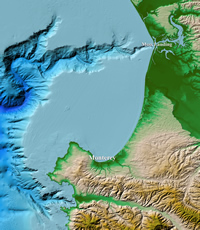 description: This service provides a color shaded relief visualization of the data. The elevations/depths are displayed using this color ramp: https://gis.ngdc.noaa.gov/viewers/images/dem_color_scale.png. evaluationMethodDescription: NCEI (formerly NGDC) makes every effort to obtain all available digital topographic and bathymetric datasets in each region for use in building the DEMs. maintenanceNote: This metadata was automatically generated from the Content Standard for Digital Geospatial Metadata: Extensions for Remote Sensing Metadata standard (version FGDC-STD-012-2002) using the 2012-08-07 version of the FGDC RSE to ISO 19115-2 transform for DEMs. maintenanceNote: This record was automatically modified on 2015-09-17 to include references to NCEI where applicable.